I am very much a football guy these days. I’m super excited for the Super Bowl (go Pats!) and will pretty much watch any team play. Especially if they’ll be beating up on the Cowboys or the Giants. I was into baseball in my youth, but never really got into basketball. The last time I really followed it, the likes of Michael Jordan, Scottie Pippen, and Dennis Rodman (back before he was Trump’s ambassador to North Korea) were all the buzz. I’m pretty ignorant of all things basketball. But for some reason, I know who Kyrie Irving is. I’m not 100% sure how I know who who is, but that’s a mystery for another time. I’m guessing I Googled him at some point, perhaps thinking he was some extended Kardashian family member (Khloé, Kourtney, Kylie, Kyrie…right?). Anyway, the wife and I stopped off for dinner at a local restaurant earlier tonight, The Beer Garden, and this story was being discussed on the big screen TVs, in between all the Super Bowl coverage. Celtics point guard Kyrie Irving is about to have another busy offseason. Irving will star in and executive produce an upcoming untitled horror movie about a rumored-to-be-haunted hotel in Oklahoma City, Imagine Entertainment confirmed to the Boston Globe Tuesday. The news was first reported by Variety on Monday. “Having had my own interesting experiences at the Skirvin Hotel, I connected with this idea immediately,’’ Irving told Variety. 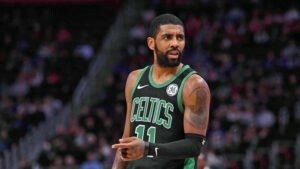 Working with the Players’ Tribune, film producers Brian Grazer and Bobby Cohen approached Irving about the concept not only because of his personal encounters with the hotel but also because of his role in “Uncle Drew’’ this past June. After starting as a series of extended Pepsi commercials, the concept was transformed into a 103-minute feature film starring Irving and other NBA and WNBA players. A diehard basketball fan himself, Cohen told the Globe he thought Irving was “great’’ in “Uncle Drew’’ and called the six-time NBA All-Star “unbelievably appealing.’’ Together, the pair will produce the upcoming Imagine Entertainment horror film with Grazer. Cohen said Irving will be the only basketball player in the upcoming movie. The group has plans to shoot during the offseason, with a trip to Oklahoma potentially on the docket. The movie does not yet have a release date. This isn’t the first story we’ve done on basketball players encountering the paranormal. Back in 2014, San Antonio Spurs players talked of ghostly activity at the Claremont Resort Hotel. Former New York Knicks player Baron Davis claimed he was abducted by aliens. The Phoenix Suns, New York Knicks, Los Angeles Lakers, the Florida (Miami) Marlins, and even Bill Simmons talked about paranormal activity at various hotels, and a New York Nets player says he spotted a UFO during Hurricane Sandy. So it seems that if you play in the NBA, your chances of encountering ghosts are much higher. No clue how this movie with Kyrie Irving will turn out, but I’m always down for more ghost stories in cinemas.